Cozy up by the fire this winter in one of Cariloha's Bamboo Blankets. These plush, eco-friendly throws are wonderfully soft. Grab one for use year-round use cuddling up on the couch. Visit the Cariloha shop at 341 King Street in the King Street Fashion District. C. Wonder has gorgeous, vibrant dishware that is perfect for a spring party or everyday use. Update your dishes with C. Wonder's herringbone, lattice, or ikat printed porcelain plates. They come in wonderful spring colors like tangerine, lime, and sorbet and are gold-rimmed for a classic touch. Mix & match prints or stick with the same kind. They have colorful napkins and placemats to pair wtih them as well. Visit your local C. Wonder store at 285 King Street or shop online at www.cwonder.com. C. Wonder, the new retail concept and lifestyle brand by Chris Burch, makes its highly anticipated Charleston debut this weekend. Join them Friday, September 13th & Saturday, September 14th at their new King Street store for a celebratory weekend filled with shopping, dancing, prizes, and surprises! Mystery cards for the first 100 customers each day – Prizes of up to 50% off! Wheel of Wonder – Spin to win! From 12-5pm, one lucky customer gets to spin the Wheel of Wonder for the chance to win C. Wonder products and VIP perks! Sweet Treats, Beverages and much, much more! C. Wonder is located at 285 King Street (between Calhoun & Market) in the King Street Fashion District. This is a shout out for all of your old and tired disposal eaten flatware. Come bring them to Croghan's Jewel Box on August 26th & 27th for a free estimate from one of the leading experts in the country on Silver replating and repair. They will be completely honest with you on whether it would be less expensive or less of a hassle to kiss it goodbye and purchase a new one, or if you should keep it and love it exactly like it is with all of its imperfection. You would be surprised by some of the treasures that are hiding in your home! Croghan's Jewel Box is located at 308 King Street in the King Street Fashion District. Fall is here and it's not too early to begin thinking about your holiday shopping at our favorite place for French home decor, Pierre Deux. And now Pierre Deux will make your next visit even more special. Celebrate L’art de Vivre à la Française All Year-Round. Mention this offer on your next visit to Pierre Deux at 279 King Street to receive a 20% discount on your purchase of non-sale merchandise. Valid one-time only at Pierre Deux, 279 King Street, on non-sale merchandise. Not valid on previous purchases. Cannot be combined with other offers, promotions and/or discounts. Limit one per transaction. Offer valid now through December 31, 2010. Code SHOPCHAR10. Pierre Deux is at 279 King Street in the King Street Fashion District in historic downtown Charleston. The Pierre Deux Summer sale continues through Saturday July 31 with big savings on select merchandise. Choose from fabrics, furniture, home decor, lighting gifts, rugs wallpaper and more. The Summer Sale is here, and the time to buy is now at our favorite breath of French air, Pierre Deux, 279 King Street in the King Street Fashion District in historic downtown Charleston. Summer is here and the time to buy is now at our favorite breath of French air, Pierre Deux, 279 King Street in the King Street Fashion District in historic downtown Charleston. The Marie Antoinette Toile Pillows are Pierre Deux masterpieces without equal, hand-worked with exquisite artistry by fourth-generation embroiderers in raised relief, the borders lushly braided. At once romantic and whimsical, the images are as captivating as paintings, the moments taken from our toile tale of Marie Antoinette at Versailles. Hand-embroidered in deep, rich vintage red on ivory linen. Our vision interpreted in partnership with Ankasa, a fashion forward textile company specializing in exquisite hand-embroidery for home furnishings and haute couture. Spring is here and the time to buy is now at our favorite breath of French air, Pierre Deux, 279 King Street in the King Street Fashion District in historic downtown Charleston. Pillows that inspire réves de romance is the quintessence of the lifestyle Pierre Deux brings home to you with the Spring Gardenia Collection. Hand-embroidered in France by fourth-generation artisans with a mastery of 18th-century techniques, the raised motifs are never-ending fantasies of urns, flowering tendrils, delicate leaves and bursts of tulle-layered flowers in full bloom, in elegant shades of ivory and taupe on honey-toned cotton the color of pastis. Pierre Deux’s vision is interpreted in partnership with Ankasa, a fashion forward textile company specializing in exquisite hand-embroidery for home furnishings and haute couture. Spring is on the way and the time to buy is now at our favorite breath of French air, Pierre Deux, 279 King Street in the King Street Fashion District in historic downtown Charleston. Renowned artist Karen Hewitt Hagan will be at Pierre Deux during the SEWE King Street Stroll, Friday February 12 from 6:00 to 8:00 PM. For one weekend each year, Historic Downtown Charleston roars to life with the Southeastern Wildlife Exposition (SEWE), the nation’s largest wildlife art and nature event. Hagan's work, showcased in private and corporate collections, can be found decorating the walls at the Sanctuary Resort on Kiawah Island, in the The Village at Wild Dunes Resort and onboard the yacht for Bakers Bay Golf And Ocean Club in Great Guana, Abaco. Her paintings depict a strong feeling of light, shadow and texture while her subject matter ranges from coastal and European landscapes to cows, chickens and flowers. Hagan has been honored numerous times, teaches plein air painting workshops and has published a book about her paintings, Karen Hewitt Hagan, An American Impressionist. Shop at our favorite breath of French air, Pierre Deux, 279 King Street in the King Street Fashion District in historic downtown Charleston. Save up to 70% off during the Pierre Deux Winter Sale. Shop fabrics, rugs, home decor, furniture and more. I love this Provencal Basket, 20"H x 25"W with olive and fir branches, sprays of lavender and wheat, red cockscomb, gold yarrow, pine cones, huckleberries and little white gooseberries gathered into a French country basket beribboned with a Maïanenco ribbon. A breath of Provence for holiday and all year round. A Pierre Deux exclusive, now only $79. With these incredible prices, and limited quantities, the time to buy is now at our favorite breath of French air, Pierre Deux, 279 King Street in the King Street Fashion District in historic downtown Charleston. 'Tis the season! Save 30% on these and many holiday items until Christmas Eve at Pierre Deux. Provencal Glass Ornaments, Taken right from the song, a Set of Three French Hens, reverse painted in the art of eglomise. One each, Red, Ochre and Blue. 3 inches in diameter. Provencal Fabric Tree. A French Country fantasy of Pierre Deux prints. Delightful decor de Noel now, a joyful note of Provence all year round. Dimensions: 15''H x 11'' diameter. For all your holiday gifts, visit our favorite breath of French air, Pierre Deux at 279 King Street in the King Street Fashion District in historic downtown Charleston. Pierre Deux has the perfect gifts for you this holiday season including a luscious selection of pewter. This wonderfully weighty pewter pitcher is faithfully reproduced from a late 18th Century French antique, down to the detail of the commemorative year engraved on its bowl. 1794 might have been a significant family date or it might have celebrated the end of the French Revolution's Reign of Terror. Today, it's the perfect gift. In honor of their one year on King Street anniversary celebration, Pierre Deux will donate $1,000 to the Junior League of Charleston and $1,000 to the Charleston Metro Chamber of Commerce. These funds will benefit the charities and institutions that both of these organizations support. The Junior League of Charleston serves as a catalyst for positive change in areas ranging from education to child abuse to feeding the homeless. The Charleston Metro Chamber of Commerce advances the region's economy, improving quality of life and enhancing its members' success. Pierre Deux's first anniversary celebration will be in their King Street store Tuesday September 22 with an entire day of events from 10:00 AM until 8:00 PM. From 10:00 AM until Noon: Enjoy French Boulangarie, assorted French breads and pastries. Pierre Deux is celebrating their first anniversary in their King Street store Tuesday September 22 with an entire day of events starting at 10:00 AM and going until 8:00 PM. Plus a merci to you, receive 15% off your entire purchase Tuesday and a gift with purchase while supplies last. Some restrictions may apply. Our favorite breath of French air, Pierre Deux is at 279 King Street in the King Street Fashion District in historic downtown Charleston. Metered parking is available on and around King Street, or park in the City Parking Decks on Wentworth or George Street at St. Philip. Enjoy savings on French Country style furniture, lighting, home decor, dinnerware, and much more. Sale now through August 2nd at our favorite breath of French air, Pierre Deux. Find Pierre Deux at 279 King Street. Metered parking is available on and around King Street, or park in the City Parking Decks on Wentworth or George Street at St. Philip. Pierre Deux has won the 1773 Chamber Award in the Retail/Wholesale Category from The Charleston Metro Chamber of Commerce. The 1773 Award is named for the year of the Chamber’s establishment and honors organizations that best reflect the core values of the Chamber: Leadership, Relevance, Integrity, Diversity and Innovation. The Chamber selected Pierre Deux as one of these dynamic businesses and industries that make up the Charleston region’s economy and support the vision and mission of the Chamber. The winners were announced at a Chamber luncheon. There's a lovely touch of spring at Pierre Deux with the arrival of the new Laval Bergere, an authentic reproduction of a Louis XV armchair. The frame a la reine (queen's frame) is upholstered in the unique charm of their cheerful Laval Stripe Floral, the carved bouquets on the backrest and apron true to the period. Meticulously crafted in hardwood with a hand-rubbed fruitwood finish. Dimensions: 30''W x 21''D x 381/2''H. You can find this beautiful upholtered chair and many fine things French at Pierre Deux, 279 King Street, in the King Street Fashion District in historic downtown Charleston, or visit them online at www.pierredeux.com. There's a little bit of Brittany coming to Charleston with Quimper French Faience at Pierre Deux. Quimper, a town in Brittany, France, is home to Quimper Faience. Traditions of pottery making in Quimper go back as far as Gallo-Roman times. Quimper designs are many and varied. Flowers, coqs, birds and the peasant figures all capture the charm of life in Brittany. Each piece is an individualistic, authentic, hand-made, work of art. What shape is your silver in? Does it need some professional help to make it just perfect? Croghan's Jewel Box will host Oexning Silversmiths in their store on February 27 and 28 from 10:00 until 4:00 pm. They will give on-sight estimates for silver refinishing. Oexning Silversmiths specializes in restoration, repair and refinishing of antique or contemporary sterling, silver plate, copper, pewter and brass. Croghan's Jewel Box is located at 308 King Street in the Fashion District in historic dowtown Charleston, has free parking behind the store, plus provides free, beautiful, gift wrapping. Pierre Deux Fun Fact: Jacqueline Rugs are an authentic reproduction of a rug in JFK's Oval Office. Ah, Camelot! These beautiful multi-colored rugs are authentic reproductions of an antique needlepoint rug that once graced the floor of the Oval Office in the White House during the Kennedy Administration. The original was purchased at the Sotheby's auction of the Jacqueline Kennedy-Onassis estate by Pierre Deux' rug manufacturer and recreated here. Jacqueline Multi-Color Rugs are hand "micro hook" construction of premium 100% wool and are available in eight different sizes from 3’ x 5’ to 9’ x 13” including an 8’ Round. Don’t miss Willy Jay’s Annual January store-wide sale happening right now with 40% off everything in the store. Through this weekend, at their King Street store, January 7 - 11, take 40% off clothing, jewelry, shoes, handbags and interiors. Willy Jay’s strives to have something for everyone and firmly believes that shopping should be fun and affordable. Visit Willy Jay’s at 300 King Street, in the Fashion district of historic downtown Charleston. Or visit their web site at willyjays.com. Get your home ready for the holidays with this early Christmas present from Pierre Deux....all of their beautiful holiday trim merchandise is 30% off through December 24th. Visit soon for a first look at their selection of fine ornaments, stockings, decorated topiaries, equisite nativity figurines, and angels too. Pierre Deux is at 279 King Street in the Fashion District. make your holiday merry. You'll find stockings to hang on the mantel, brightly colored ornaments for the tree, a very special Christmas Almanac, and so much more. Luxury at its best. Pierre Deux is at 279 King Street in the King Street Fashion District. Friday, October 24th Pierre Deux and Southern Accents will celebrate the Posh Pets Designers' Challenge, hosting a reception to unveil Adrian Sims Truluck and Anne Melvin's Chateau du Chien. The Posh Pet retreat was created with Pierre Deux fabrics for a cozy bed and a good cause, 10% of sales will be donated to Canine Companions for Independence. For a sneak preview, attend Thursday night's Design Walk In the Upper King Design District, where Three Dog Bakery will display the Parker Sims creation. Charleston’s Upper King Design District is pleased to announce their Fall Design Walk, Thursday October 23--just a week away--from 5:00-8:00 pm. From Calhoun to Spring, stores will remain open late for shoppers, offering special events and refreshments. Many restaurants in the District will have food and wine specials after 8:00 pm, plus The Charleston Ballet Theatre will offer a free performance of dances from their upcoming season beginning at 8:00 pm. This year’s Design Walk is particularly special because it is the kickoff event for Charleston Magazine and Charleston Home’s new Charleston Home Market, October 23 - 25. This new event offers a Lowcountry stop to fall buying trips by pairing Southeastern interior designers, architects and buyers, as well as area residents, with Charleston-made goods and the local artisans who create them. • Cupcake will have a celebrity "froster"
• There’s more. Watch www.upperkingdesigndistrict.com or call 843.303.1113. See you there! Pierre Deux Charleston and Hampden Clothing cordially invite you to Travel in First Class Style. Thursday, October 16th, 2008 from 6:30 pm - 8:30 pm at Pierre Deux, 279 King Street. Enjoy an evening of champagne and cupcakes as you shop Hunter Dixon's fall collection, merchandised in Pierre Deux's new Voyager Trunks. 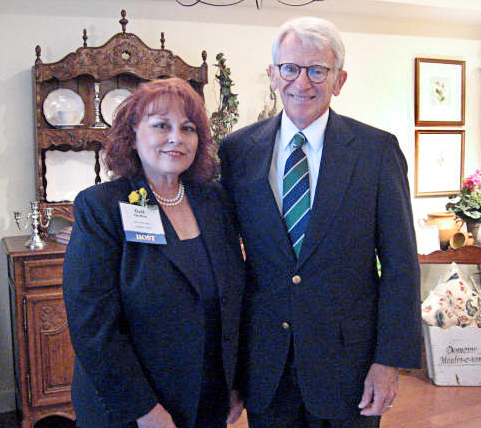 That's our Mayor Joe Riley with Pierre Deux Manager Gail Griffen at the store's recent opening celebration. Pierre Deux, "All that is French Country" is located at 279 King. Its beautifully renovated space includes two levels of pure French inspiration, an interior design service and a picturesque rear courtyard. Walk into France right here in King Street's Fashion District. For more information contact Gail or her staff at 843.724.5880. Charleston's historic King Street Shopping is considered by many to be the best anywhere. Centered between Market and Calhoun Streets you'll find the Fashion District, a perfect blend of shops, restaurants and attractions that makes Rodeo Drive pale by comparison. 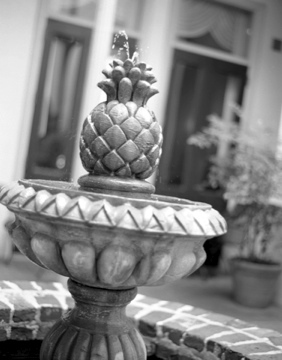 From the Lower King Street Antique District to the Upper King Design District, our "three kings" are a slice of heaven right here on the beautiful Charleston, SC peninsula. Watch this space for a complete directory of our shopping mecca, as well as news in and around the District to help you know when to come, where to park and what to do once you're here. Better yet, sign up for our email newsletter (top right) and you'll always know when there's King Street news.